CHICAGO, July 19, 2018 /PRNewswire/ -- In a significant shift from the previous year, women have made substantial progress in the boardroom, according to a new report from Heidrick & Struggles (Nasdaq: HSII), a premier provider of executive search, leadership assessment and development, organization and team effectiveness, and culture shaping services globally. In Heidrick & Struggles' Board Monitor, an annual study of trends in non-executive director appointments, women filled 38.3% of all newly appointed independent board seats in Fortune 500 companies in 2017. This is the largest percentage of women among new directors since the data was first tracked in 2009, up from 27.8% in 2016 (which at the time ended a seven-year run of year-over-year gains in female director appointments). Extrapolating data for 2017 using a three-year trailing average method, Heidrick & Struggles projects parity with men in new appointments by 2025. 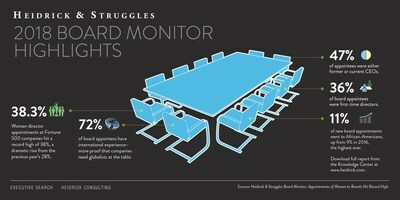 For more information on the 2018 Board Monitor, visit www.heidrick.com/Knowledge-Center/Publication/Board_Monitor_2018. 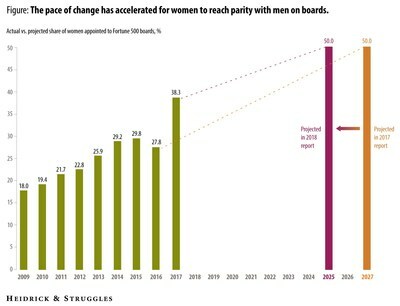 "This latest research indicates that boards are taking action to make significant progress toward gender parity, contributing to the dramatic spike we saw in women director appointments," said Bonnie Gwin, vice chairman and co-managing partner of the CEO & Board Practice, Heidrick & Struggles. "While we're optimistic about this improvement from last year's report, there is still more work to be done to improve gender diversity in the boardroom." Despite improvement in appointments for women, there has been only slight improvement in gender composition on boards overall, with the overall percentage of women on Fortune 500 boards having risen only to 22.2% in 2017, up 1.2 percentage points from the previous year. This data indicates that most new female director appointees were replacing other women who had left their board roles. "The Board Monitor findings align with the many conversations we're having with our clients, who are increasingly looking for diverse talent to bring fresh perspectives into their boardrooms," said Jeff Sanders, vice chairman and co-managing partner of the CEO & Board Practice, Heidrick & Struggles. "We are encouraged that this latest data shows an acceleration toward greater representation of women on boards. As companies look beyond the 'usual places' to fill open seats, they are refreshing their boardrooms to be more reflective of today's workforce and marketplace." Nearly 36% of new board appointees in 2017 had no previous board experience. This is up sharply from 25% in 2016, which is at least partly in response to pressure in recent years to bring new perspective to boards. Boards are also beginning to look beyond their traditional first choice of CEOs to fill vacant seats. Current and former CEOs accounted for 47% of director appointments in 2017, down from 50% in 2016, 54.4% in 2015, and well below the high of nearly 55% in 2013. The share of new board appointments that went to African-Americans rose from 9% to 11%, the highest ever. Some 33% of all African-American appointees went to industrial boards, the same as last year; 23% went to consumer boards, and 21% to financial services boards. These gains may be driven by the overall awareness of the value and need for diversity on boards.